Greek gods and their offspring are a common theme as far as online slot machines are concerned but another one is always welcome as long as it’s a good’un. What we have here is Hercules Son of Zeus, a release from Pragmatic Play with an enhanced free spins round – find out it works below. Hercules Son of Zeus is a five reel slot with four rows and fifty fixed paylines; those reels spin within the entrance to a temple supported by huge columns on either side – a setting sun is just about visible in the background. All the symbols are theme-related and include Hercules along with various animal/god representations on the tops of columns – the three headed Hydra for example. Zeus’ temple is wld and it will substitute for all others to help form winning combos except for the Zeus scatter icon which is the key to the main feature. 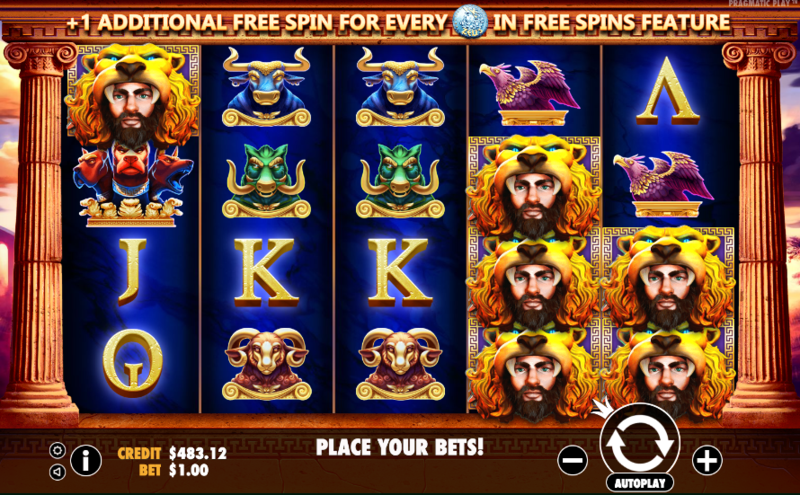 This is triggered by landing three of the Zeus scatter symbols anywhere in view on reels two, three and four and you will initially receive six free spins. When the spin get underway, one wild will be added to reel two, three or four and that wild symbol will remain on the reel set until there are no more spins left. Six spins may not seem that generous but each scatter symbols which lands will award one extra spin and there’s no limit to the number of additional spins which can be won. 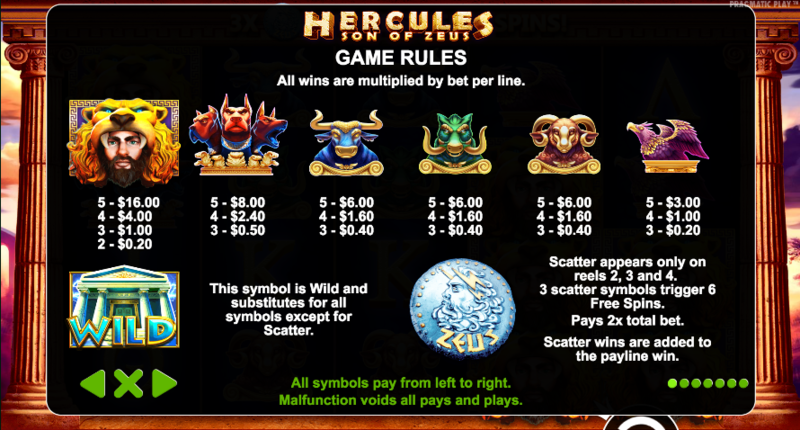 Hercules Son of Zeus may be a little basic in the graphics department but it’s bold, colourful and it clips along at an enjoyable pace; the free spins round should prove profitable for the luckier players and there’s an RTP of 95.19%.